DUN DUN NUH NUHHH! 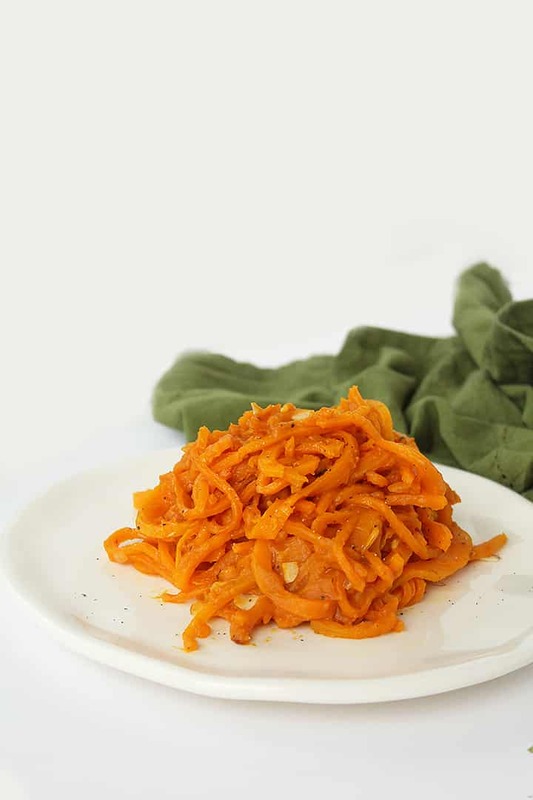 It’s our first butternut squash noodle recipe of the 2014 fall season! Y’all, it took me a solid 3 minutes to figure out “dun dun nuh nuhhh” – thankfully, I’m alone in my apartment or else people nearby would have thought I had escaped from an asylum. Yes! 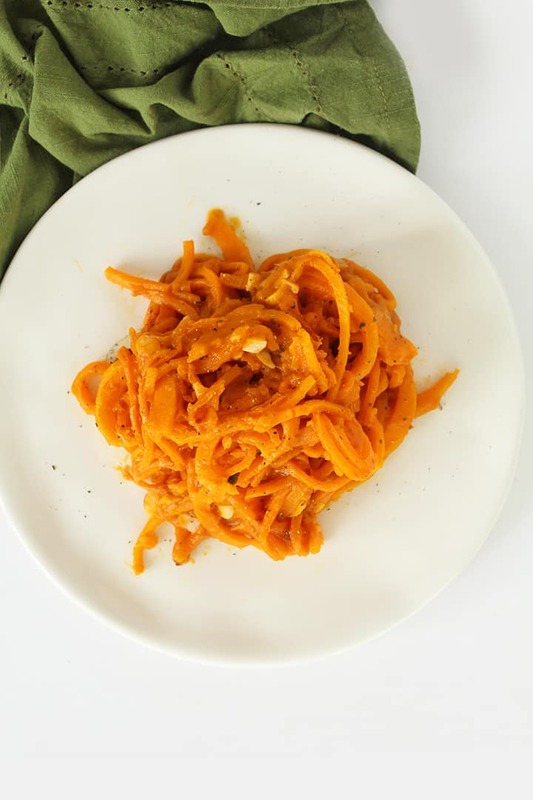 Grab your teapots and leg warmers, folks, we’re spiralizing butternut squash! And that’s not all… we’re making a pumpkin-sage sauce. I mean, I probably can’t get more cliche than this recipe, but it’s sensational and it’s….. vegan! As Kim-K would say, sure, I’m acting cray-cray today but yesterday, I had the last photo shoot session for my cookbook and we shot the cover (front and back) and it looks beeeeeautiful! Naturally, I’m excited. 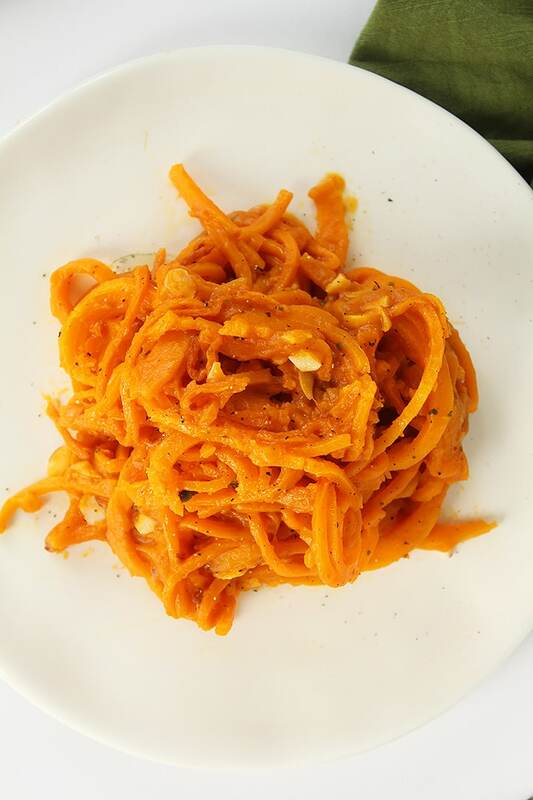 Also, I love love love spiralized butternut squash. It makes a fantastic rice, but it’s also just amazing as pasta. It can get a little tricky to cook in the oven – I usually cook it for exactly 8.5 minutes, but all ovens are different, so check after 8 minutes to make sure it’s not overcooked and you probably won’t want to exceed 10 minutes. Listen, it’s a small price to pay for an incredibly delicious pasta noodle that’s low-carb, low-fat, low-calorie, Paleo, gluten-free, vegan and well, nutritious! If it breaks apart, that’s okay – it still comes across like pasta and the sauce saves the day. Did I mention the sauce is vegan? Yes, and, if you’re not vegan (or you’re not concerned about eating dairy), fold in 1/4 cup of grated parmesan cheese after you stir in the almond milk (or vegetable broth), take the skillet off the heat and stir to combine. It will be extra savory and salty, which I love. Seriously, when I was photographing this, I couldn’t wait to type up this post and go build my fall bucket list (yes, I get distracted easily sometimes when I’m excited). Seeing this plated butternut squash and pumpkin dish made me think of how much I love the fall time and it makes me thankful that I live in an area that has a proper autumn. I’m such a girl sometimes, and I apologize. Clearly I ate my Wheaties this morning (or drank too much coffee) – I’m going to go chug some water and work on some more fall-inspired dishes for the rest of this week. Adieu, friends… adieu. 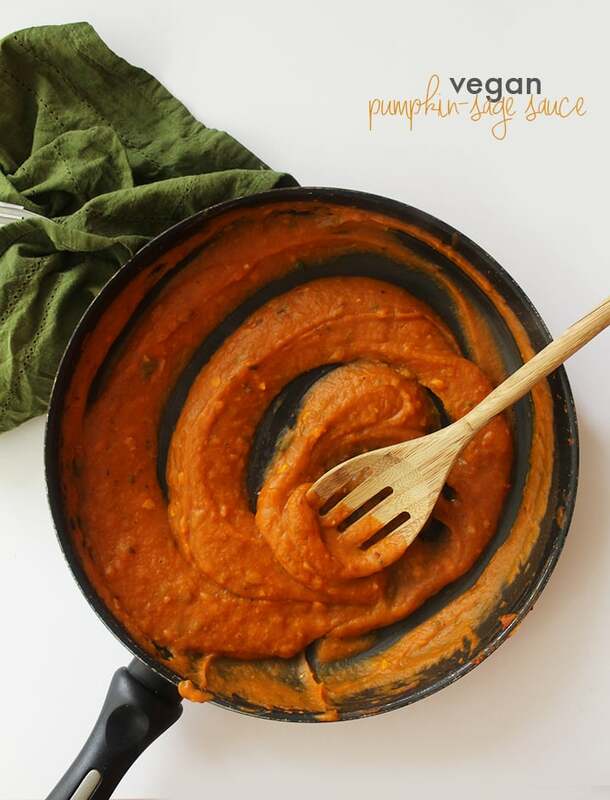 While the butternut squash is cooking, prepare the pumpkin sage sauce. Place a large pot over medium heat and once heated, add in the olive oil. Once oil is shimmering, add in the sage and fry until crispy (about 3 minutes) and then remove with a slotted spoon and set aside on a paper towel lined plate. Add in the garlic, red pepper flakes, shallots and cook for 1-2 minutes or until shallots are translucent. Add the tomato paste and pumpkin and stir to combine thoroughly. Then, add in the milk, season with salt and pepper and stir until sauce thins out and absorbs the milk. Then, add in the nutritional yeast flakes, if wanted. Raise heat to high and bring to a boil. Lower to a simmer, crumble in the sage, stir and let flavors develop, while the butternut squash finishes cooking. While sauce is simmering, place a small skillet over medium-high heat and add in the slivered almonds. Toast for 3-5 minutes or until lightly browned on all sides and fragrant. Be careful not to burn. When done, transfer to a small plate and set aside. When the butternut squash is finished, portion into bowls and pour over pumpkin sauce. Top each bowl with a tablespoon of the toasted almonds. Alternately, toss the pasta in a large mixing bowl with the almonds and sauce to combine and then portion out to serve. *Make sure you cut the bulbous end of the squash off before spiralizing. **This is to add a cheesy, creaminess to the dish with added savory flavor. In the first step of the sauce do you mean sage when you said thyme? Yes, it's a fantastic reason! So, I have been following your blog for a while and tried to use a smaller imitation spiral cutter. I just bought the Paderno spiral cutter yesterday....I am in love. I can wait to do more spirals!! I had some cooked beets and onion and made simple spiral cut beets and onion and pickled them. I smiled the whole time I ate them. Sounds wonderful! I hope you're feeling better, Ali! When I'm not dealing with ongoing triple digits, , I'll be cooking even more. For now it's tons of zoodles, shredded chicken, other veggies, light dinners. Hate the heat!!! Yay!!! That's so exciting! I'm so happy to hear that, Christine! This new recipe will happen this weekend, now that our triple digits have calmed! Yayyyy, I'm waiting for the cookbook to happen also! Mine is a question about spiralizing the squash. You state that we need to cut the bulbous end off first. 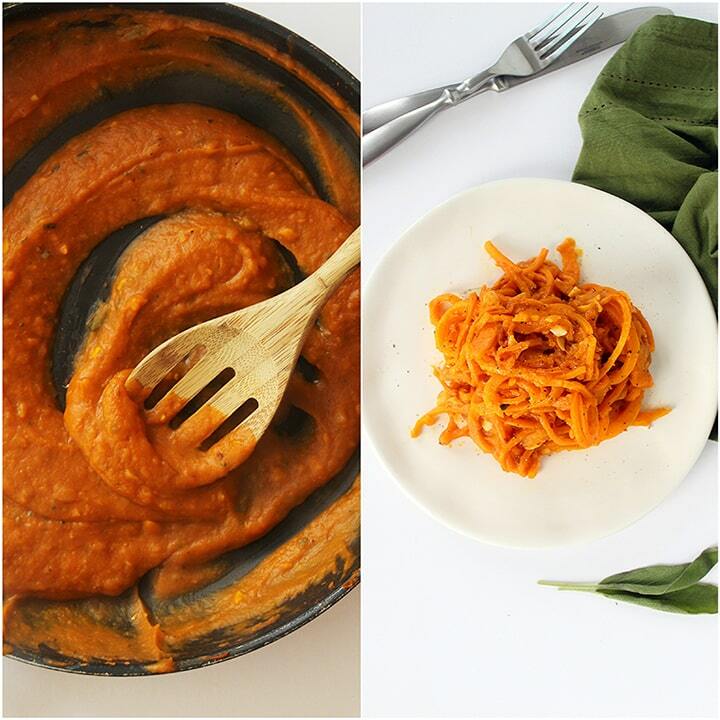 Does that you use it (spiralizing it also) or don't use it? Purchased a butternut squash this weekend and can hardly wait to try this recipe, thank you! 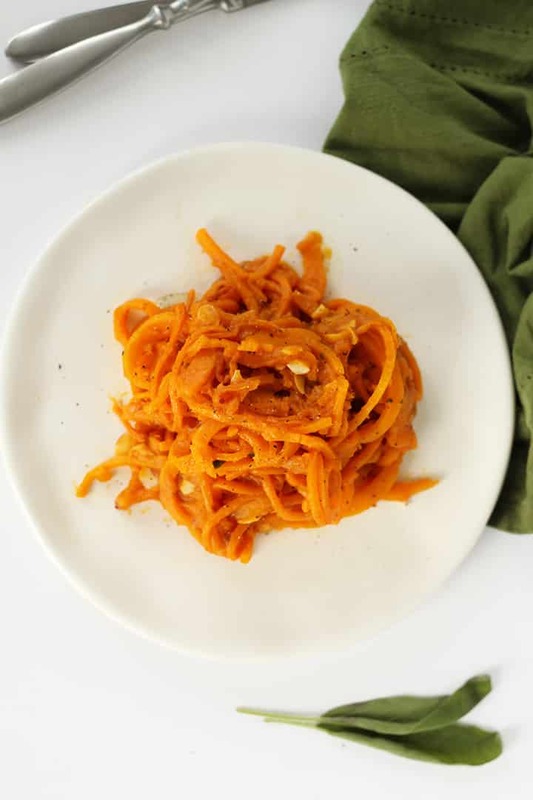 I found the PERFECT butternut squash to spiralize - with super-long necks - at the grocery store this week and snapped them up! I have decided on this recipe for tonight as a pre-Thanksgiving dinner, although I'm adding chicken because #iloveprotein <3 Remember that movie "Julie & Julia" where Amy Adams makes a recipe from "The Joy of Cooking" every single day until she's cooked through the whole book? I kinda want to do that with your blog... :-) Happy Turkey Day! I'm thankful for all your food inspiration!